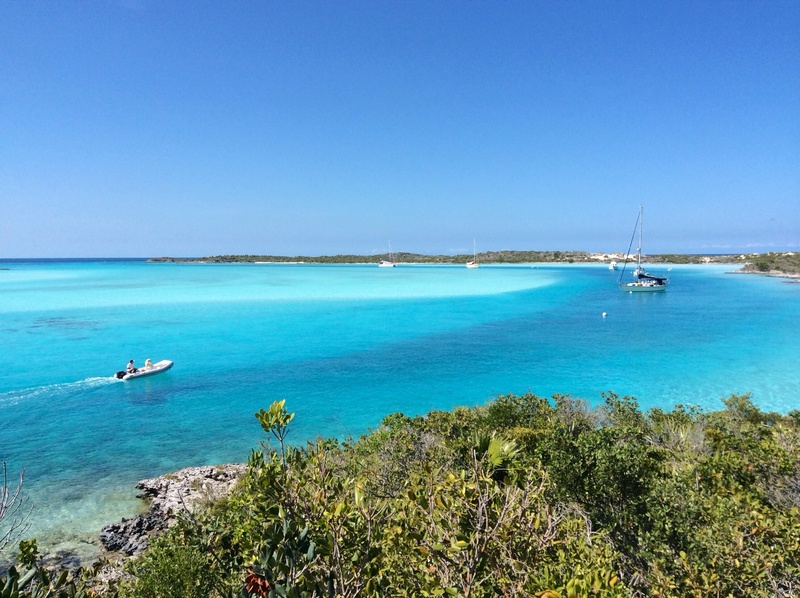 After a comfortable motorsail across the Exuma Sound from Warderick Wells to the town of Rock Sound in Eleuthera, we went grocery shopping, took Sailor to a beach and rested for the remainder of the day. The next morning we motorsailed to Governor’s Harbour and decided to rent a car to tour some parts of Eleuthera we hadn’t visited in the past. We stopped for lunch at the Rainbow Inn in Hatchet Bay, which we highly recommend. Luckily for us almost all of the restaurants here have outdoor deck seating, usually looking over the water, because Sailor is always with us. In this case we ate on the deck but they were so dog friendly we could have eaten inside the restaurant. We had an enjoyable conversation with cruisers who live in Palm Beach and we learned we had anchored next to their home on Lake Worth where they also dock their yacht. The second beach is at the old Club Med, which was destroyed in a 1999 hurricane. Ruins of the buildings are still there on the hill above the beach. The area is now called French Leave and apparently the new owners are going to build a “marina village” on the property. Of course, we were alone on both beaches. 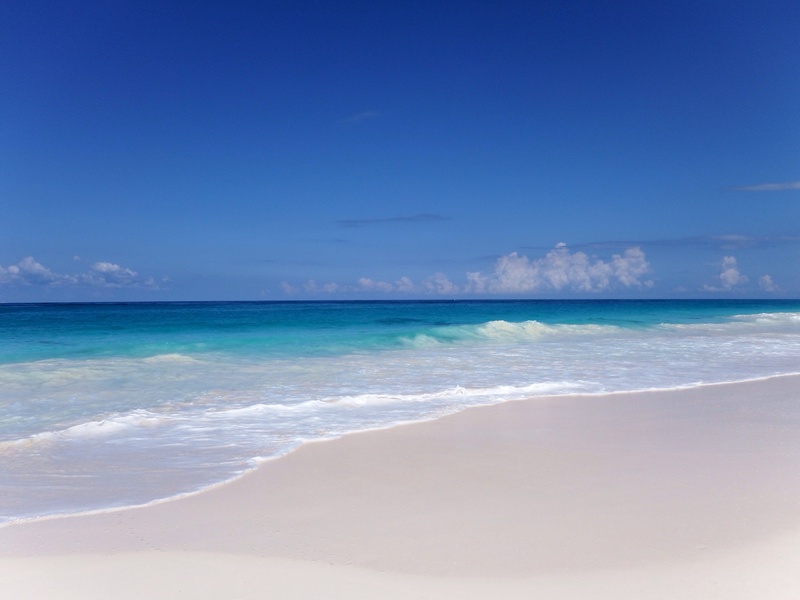 These are only a few of the gorgeous Eleuthera beaches. 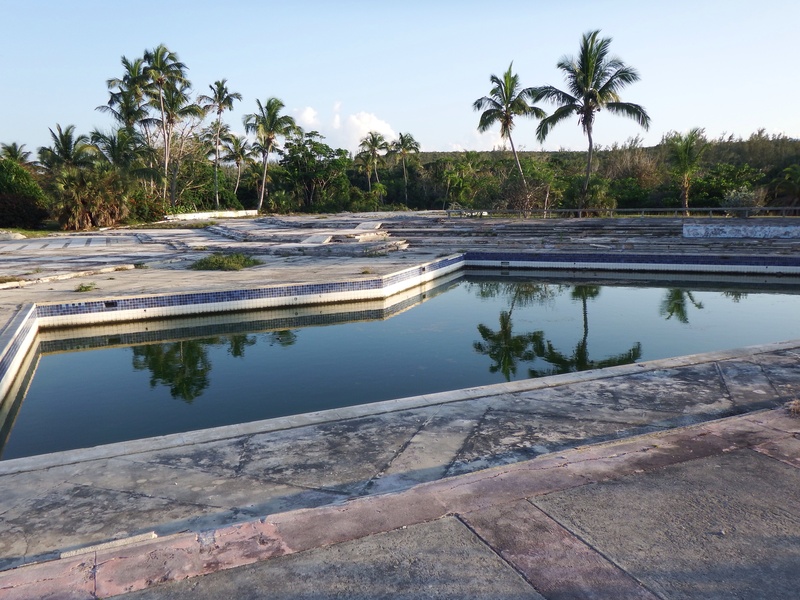 Below is what is left of the huge swimming pool at Club Med. Much of the property still has intricate stone walkways and lovely landscaping. We also stopped at a small beach by Gauldings Cay, a tiny island in the Sound. The sandy beach is great for swimming and there is a nice little park by it for picnics. 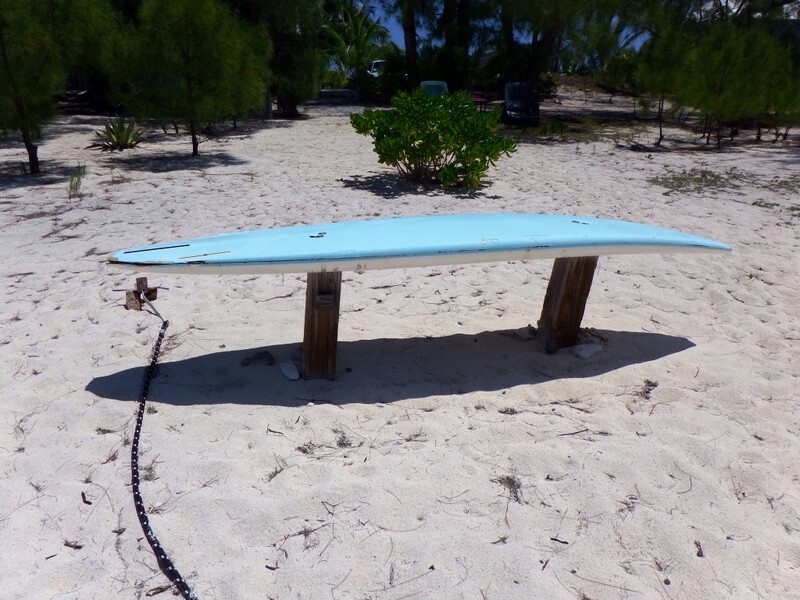 I had to take a picture of this unique table in the yard of one of the houses on the beach in case my son would like to do this with one of his old surfboards. This entry was posted in 2013 - 2014 Bahamas Cruise, Eleuthera on April 29, 2014 by Jan.
We like to end our Bahamas cruise by sailing from the Exumas to Eleuthera and then north to Spanish Wells. 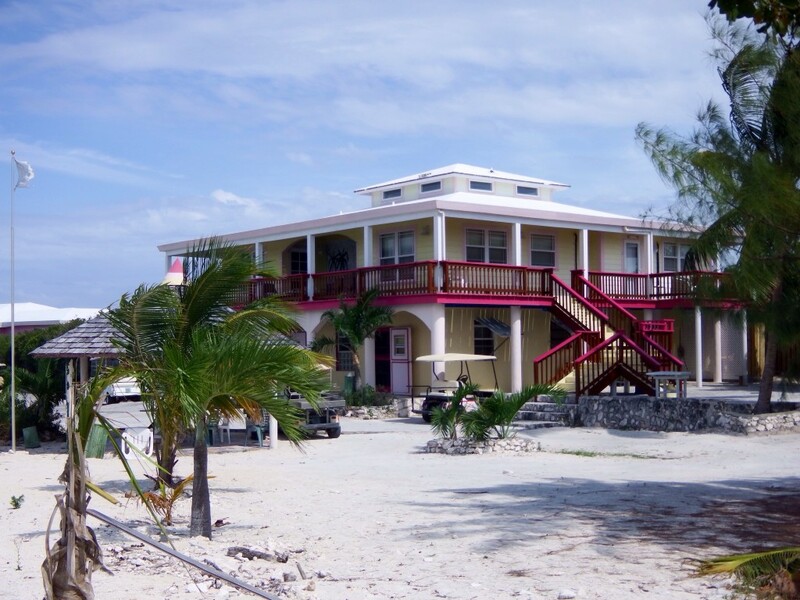 A good place to cross is at Warderick Wells in the Exuma Land and Sea Park. We met up with good friends on Interlude, Cathie, Tom and their son Chris, who was visiting them, and enjoyed our last game of Mexican Train before they sail back to the States in a few weeks. We stayed for two nights in the north mooring field which is one of the most picturesque settings in the Bahamas. In the photo below, Mark and Sailor are on their way back from a beach visit. The different colors of water are due to depth. It’s easy to find the deep part which is the darker color where the boats are moored. The darkest water color is on the left side of the photo where there is a cut to the Exuma Sound and very deep water. Snorkeling is good here because no living things can be removed thus we see large lobster and many varieties of fish. Shells cannot be taken from the beaches. 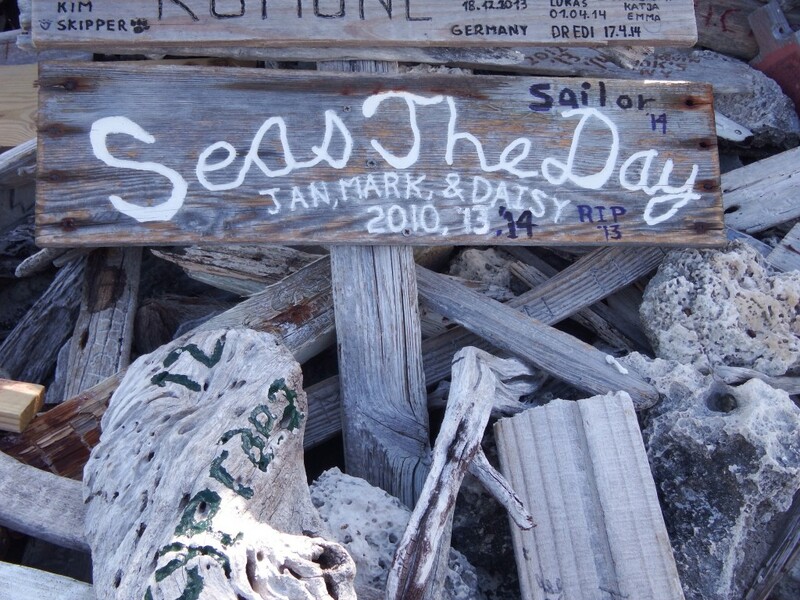 Everyone likes to hike up Boo Boo Hill where you can leave a sign with your boat name on it. The sign must be made from a natural material, usually a piece of wood. We made our sign in 2010. 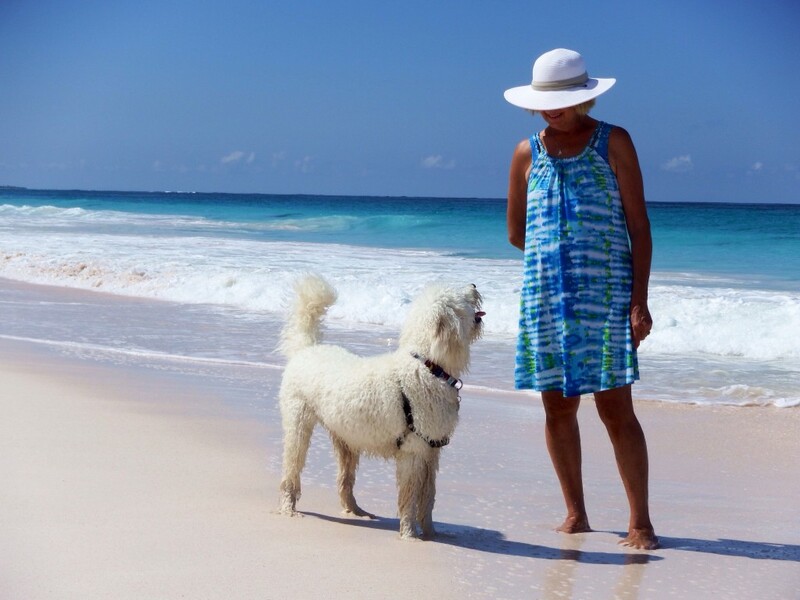 In 2012 friends Lynn and Shelley on Anything’s Pawsible found it and sent us a picture. We saw it next in 2013 and added the date of our visit. Shortly before we arrived here this year we got an email from Minnesota cruiser friends who had just been to Boo Boo Hill, found our sign underneath some others and put it in a more prominent place. Therefore, we quickly found it a few days later thanks to Bill and Judy on Jubilee. Mark had used a dremel and paint to create the original lettering, but this time we didn’t have the tool charged so we just added “RIP 2013” by Daisy’s name and added “Sailor” along with 2014 all in Magic Marker. 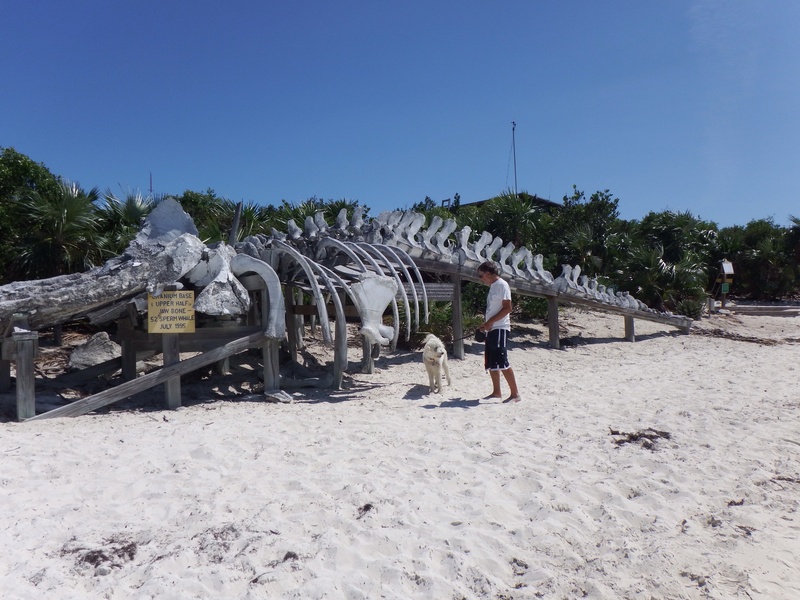 Another site at Warderick Wells is a skeleton of a Sperm Whale. Sailor loves bones, but he didn’t attempt grabbing these. By now, Sailor is probably totally confused about where he is and we have lost count of the number of beaches he has visited. 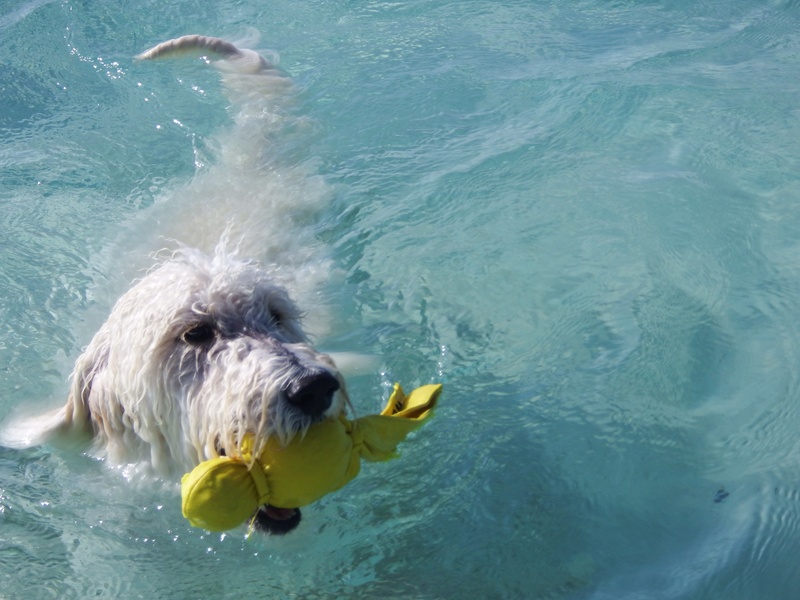 However, regardless of the island or the beach, Sailor is happy if he can just fetch his floating Kong Wubba. This entry was posted in 2013 - 2014 Bahamas Cruise, Bahamas and tagged Exumas, Warderick Wells on April 29, 2014 by Jan.
Last year we were boat buddies for several weeks with some new friends traveling on a trawler. They had been cruising for a few years but told us that they were selling their boat…..and they did last summer. They were simply tired of always having to adjust their plans due to weather. 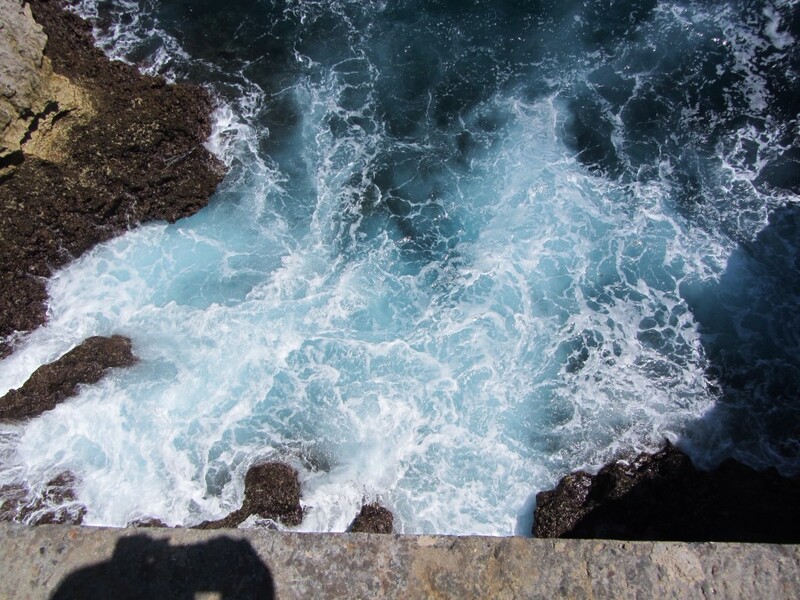 We hear that frustration from fellow cruisers often, especially in the Bahamas. There are so many advantages to cruising in the Bahamas, but there is no question that you have to know the weather forecast and be ready to move, or not move, when the wind direction changes. We subscribe to Chris Parker’s “Marine Weather Center Services.” He broadcasts a weather forecast for the Bahamas Monday through Saturday at 0630 and 0800 on SSB (Single Side Band) radio, and on his webcast viewed on a computer or with his iPad APP. His Caribbean forecast is at 0715. We usually listen to him on the iPad. After his forecast, subscribers can ask specific questions about weather in their area or request recommendations for when to move to their next destination. Anyone with an SSB can listen to his forecast, but only subscribers can ask questions, view his webcast, or receive his daily email weather reports. In The Exumas, each island has a shallow side (“The Banks”) on the western shore and a deep side (The Exuma Sound) on the eastern shore. We are always anchored on the Bank side. 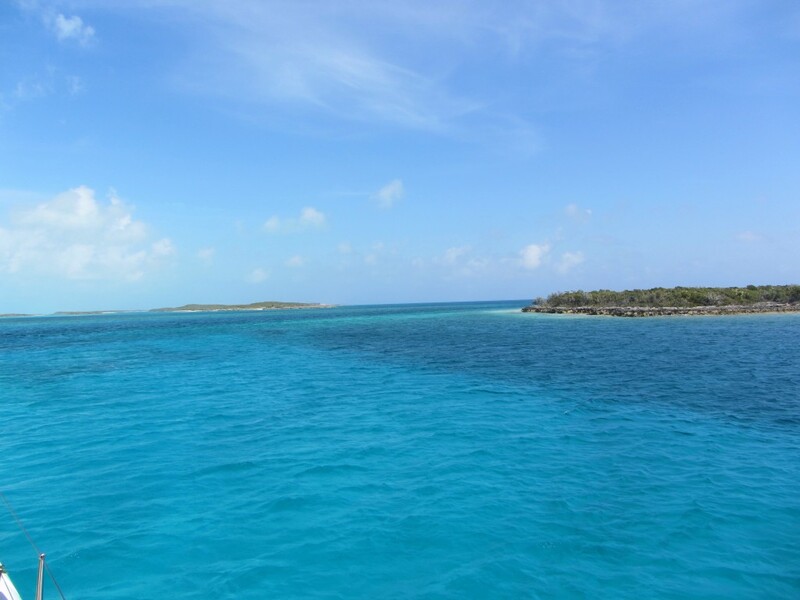 Very few islands in the Bahamas have anchorages good for all wind directions but most have several anchorages with protection from some wind directions, and if not there is usually another nearby island a few miles away where protection can be found. If the wind is from the west, often it is difficult to find a protected anchorage since most of the islands are open to the west. When the forecast is for very strong winds and possible squalls, the VHF radio is busy with calls to the few marinas to reserve slips and the mooring fields fill up quickly. 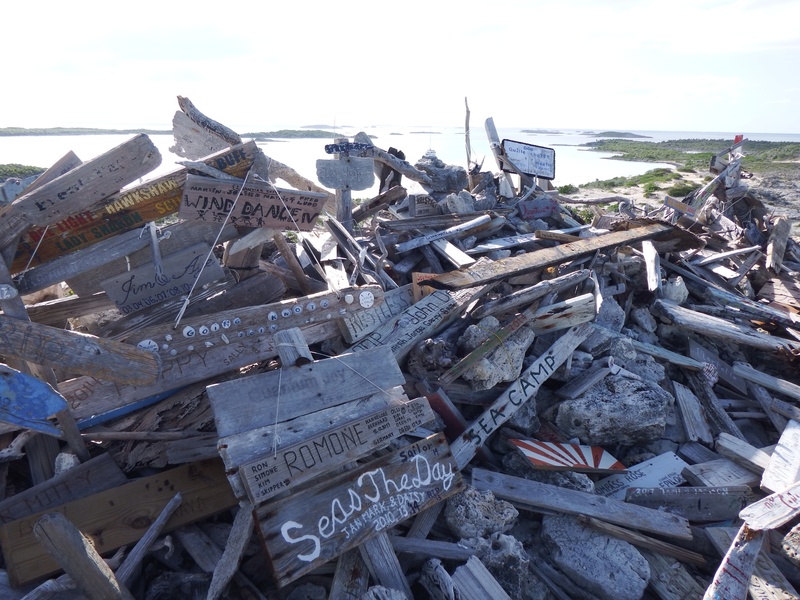 Last week we were at Staniel Cay in the Big Majors anchorage, where most of the boats stay…..until the wind clocks to the west when there is no protection in that area. We knew the weather would be changing, so a few days before the wind direction was due to clock, we moved to a different anchorage in the Staniel Cay area which has great west wind protection. We were alone in the anchorage until the day the wind direction was going to change. Beginning in the morning, boats migrated over to us from Big Majors and other nearby anchorages. Most followed good anchoring etiquette and spaced their boats well away from others hopefully putting out plenty of chain so they wouldn’t drag. One of the last boats that came in anchored right between us and another boat, even though there wasn’t room. There was plenty of space behind us, but apparently they didn’t want to go there. We knew as soon as the wind clocked from the south to the west we’d be in trouble. That happened in the middle of the night during a squall with 30+ kt wind. We watched as the boat passed behind us with only a few feet to spare. The squall continued as their boat floated back and forth very near us so finally I went into the cockpit and shouted back to them to let out more rode (chain) since they seemed content to stay on top of us. The young French woman (in her bikini) simply shrugged her shoulders. (I’m not sure if they didn’t understand English, which is doubtful, or she just didn’t care.) Finally, they did let out some more chain and then got too close to the boat that had been next to us before they squeezed in between us. Below is a photo I took through our salon window during the storm. They were even closer to us when they crossed behind us. In Georgetown, where there are many available anchorages for all wind directions, some boats shuffle from one place to another every time the wind changes directions. We usually stay in one place unless the forecast calls for squalls with over 30 kts of wind since holding is excellent and we don’t mind a little rocking and rolling. Of course, wind is also a big consideration for us when moving from one island to another, or crossing to and from Florida. When it comes to wind, there seems to be two types of sailors. One group loves to sail and waits for lots of wind, in a direction that will fill their sails. Also in this group are the sailors who don’t want to use fuel unless absolutely necessary. The second group, which we belong to, likes wind but not if it brings big waves. Therefore, we always wait for lighter winds and a calmer sea and then motorsail to our next stop. Of course no cruiser likes to sail directly into the wind, so if you are going south and the wind is from the south, you wait until it changes or drops unless you love plowing through waves and making slow progress. Further, crossing the Gulf Stream off the US East Coast, one never wants to leave with a wind from the north because this kicks up large waves going against the northerly flowing Gulf Stream. 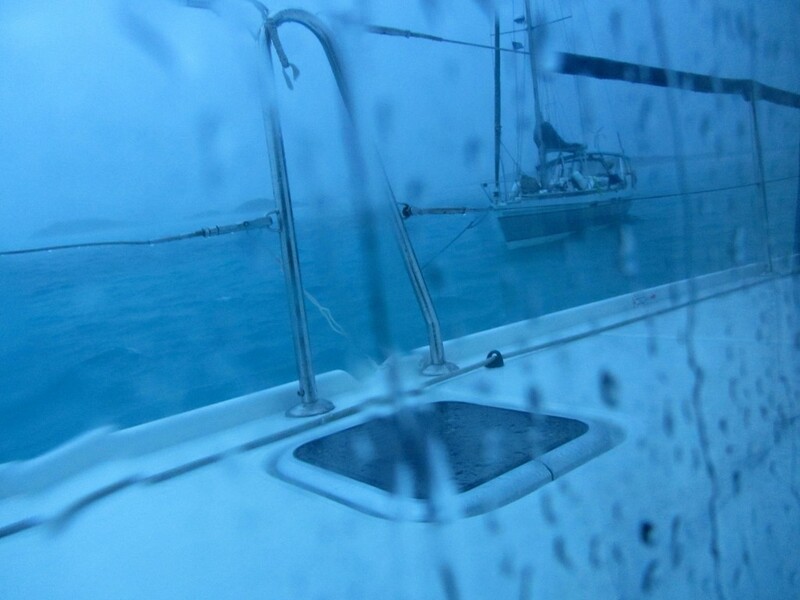 Right now, scores of cruisers who have spent the winter in the Bahamas are waiting for favorable wind and sea conditions to get back to the States and in a safe place for hurricane season, which begins June 1. Sailor doesn’t care which direction the wind is from or the speed. But like all dogs, he loves to feel it blowing in his face. 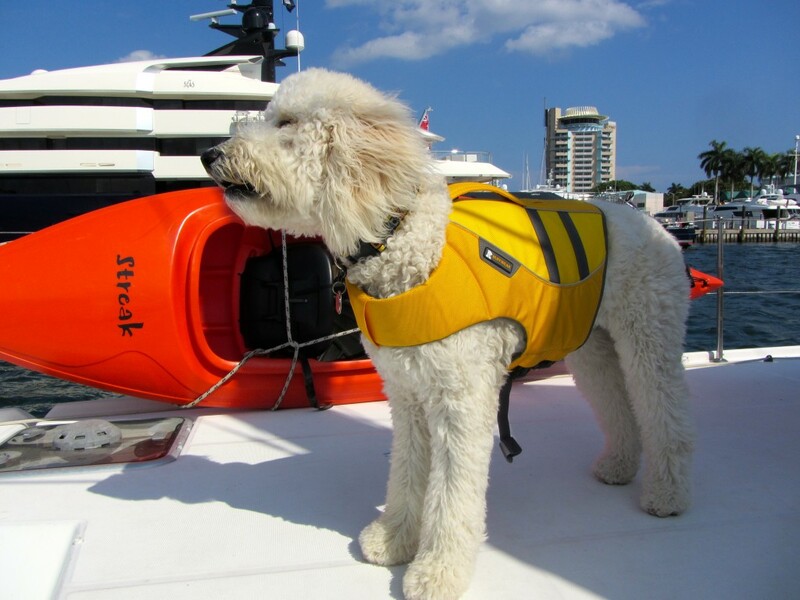 This entry was posted in 2013 - 2014 Bahamas Cruise, Sailing and tagged Wind on April 26, 2014 by Jan. Some say this is the definition of cruising: repairing your boat in exotic places. Tied to a dock for six months, we rarely find anything that needs to be repaired because we don’t use many of the boat’s systems when we aren’t sailing and are connected to shore power. A few days before we left this year we turned on the chart plotter and discovered the backlight circuit had failed. It was cheaper to buy a used display than to get it repaired. We found several on eBay and drove a few miles to pick one up. Once we leave the dock and all systems are running it’s not unusual to discover something needs to be fixed. We hope that it happens before we leave the States where parts are readily available, but of course that isn’t always the case. There are old boats and new boats, but no matter how carefully they are maintained, repairs are a necessary part of cruising. Seas the Day is only five and a half years old and she has been at a dock for over half that time, during hurricane seasons. Even with excellent care, there are many intricate systems aboard and eventually parts fail. Several days after we left Stuart we arrived in Miami and discovered the watermaker wasn’t working. A Spectra Watermaker technician who lived nearby diagnosed the problem, ordered a new pump and in a few days the watermaker was working again. When we got to the Bahamas, we realized that we were having a voltage drop between the batteries and the buss where the power is sent to everything that needs it. The batteries and buss are connected by a long cable. This was a major problem last year, but we hoped with the addition of a sixth battery and the new wind generator we would have plenty of power even with a voltage drop. If the voltage is low the freezer turns off, even though there is plenty of power in the batteries to keep it on. In the middle of the night our voltage might be 12.2V at the batteries but the buss reads 11.7V. Last season Mark made some changes which helped including putting in a better cable, but decided to take another look. After checking everything he couldn’t figure out anything else to do so he started to put things back together and suddenly there was a burning smell and a cloud of smoke came out of the top of the inverter. Mark has done the same procedure multiple times when working on the batteries and nothing happened. This time the inverter stopped working. Without the inverter, we have no AC power so the outlets don’t work and we can’t watch TV, do laundry, use the breadmaker or ice maker, or charge electric toothbrushes and camera batteries. We can’t use the microwave, the toaster, a blow dryer or a coffee bean grinder. We have 12V chargers (cigarette lighter chargers) for our phones, computers and tablets, Kindle, etc. so we don’t need AC outlets for them. Most of the systems on the boat run on 12V and they don’t need the inverter either. We didn’t panic, but realized if we weren’t able to replace the inverter, or repair it, our living conditions on the boat would change. Oddly, the next morning we noticed the inverter was back on! Apparently when it overheats it turns off and when cooled down resets itself. Broken parts rarely fix themselves so this time we were lucky. Next, our 21KW generator (huge and left over from when we were a hybrid boat) stopped working. We use it to charge the batteries if the solar panels and wind generator don’t give us enough power during the day. We don’t run the generator often, but sometimes on a cloudy, still day we need an extra push to keep the batteries charged high enough through the night. Mark tried several possible fixes, but in the end discovered that the repair is inaccessible without removal of most of the outer cabinet work and possibly the genset body, which won’t happen until we get back to Florida. Our only alternative now is to run one of the diesel engines for a half hour or so to charge the batteries. This isn’t a good practice because it puts unnecessary hours on the engines but until we repair or replace the generator this is our only choice. Luckily we don’t have use the engines while we are anchored very often since there is plenty of sun and wind in the Bahamas to keep our batteries charged. One day in Georgetown, the dinghy motor died while Mark was crossing the harbor to go to town. The current pushed him along while he tried in vain to fix it. A couple in an anchored motor yacht noticed his dilemma, lowered their dinghy to go rescue him, towing him back to our boat. After a few hours, Mark had repaired the motor. It would be a disaster if we didn’t have a dinghy motor because the dinghy is our “car” while we are here. The next mechanical failure was the watermaker….again. Until this year, it had been working perfectly, making clean water out of sea water whenever we were away from a dock. The watermaker was running on our way from Williams Bay to Blackpoint but shortly after we dropped the anchor we ran out of water. I had done four loads of laundry on the way there that day, but this was not nearly enough to empty the tanks which hold 120 gallons. There is no gauge on the tanks but the watermaker makes 12 gallons of water an hour and the tanks should not have been empty. Removing the floorboard over the watermaker, Mark saw water running out of a broken part and collecting in the bilge. Until we were able to get a new part, the watermaker would not work. Many cruisers here do not have watermakers and get along fine. In reality you never make up the money it costs to buy a watermaker, but it is convenient to be able to have all the water you want, any time, any place. We were near Staniel Cay so we brought the boat to the fuel dock, purchased 120 gallons of water at 40 cents a gallon, emailed the watermaker dealer in Florida and ordered the part. Then we went a few miles north to Cambridge Cay to get protection from an approaching front and waited for the part to arrive. It’s very easy to get mail at Staniel Cay via Watermakers Air whose small airplane flies round trip from Ft. Lauderdale twice a day. Within two days our new part was waiting for us at Staniel Cay. Photos below are from Cambridge Cay and Staniel Cay where we have spent the last few days. This was the view from our mooring ball at Cambridge Cay. We were at the end of the field of 12 mooring balls, all taken by boats needing protection from a front passing through the Bahamas. Obviously this picture was taken before the strong winds and choppy seas arrived. Some dogs love to stick their head out of a car window. 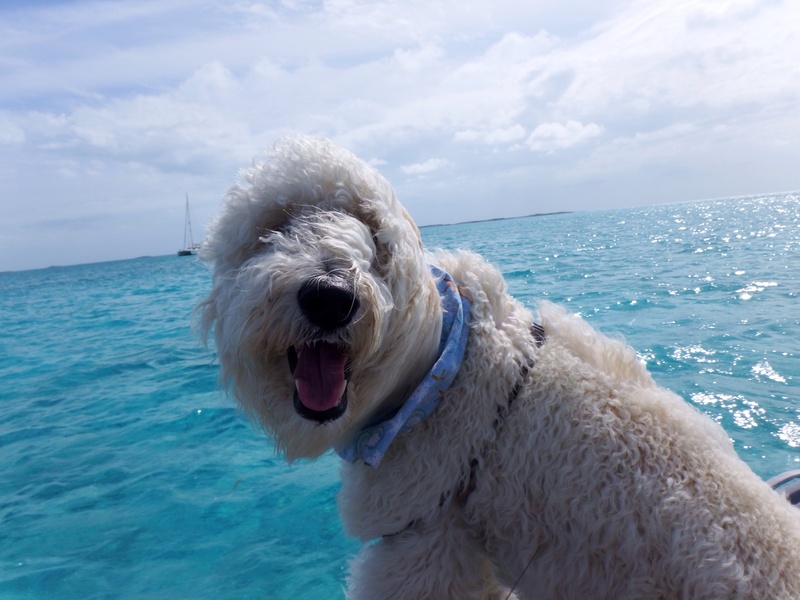 In the Bahamas, our dinghy is our car and Sailor, like all boat dogs we’ve ever seen, enjoys riding in the dinghy and he doesn’t even need a window to feel the wind in his face. 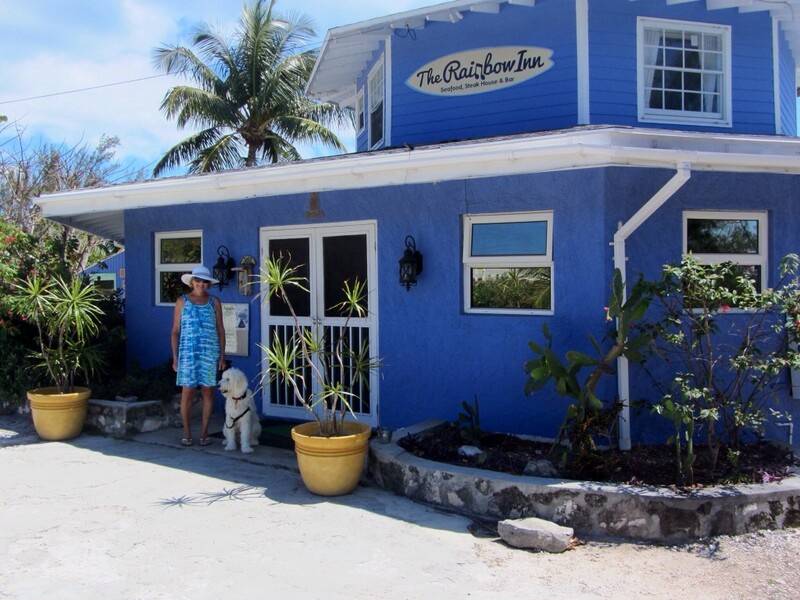 In Staniel Cay there are three grocery stores: the Pink Store, the Blue Store, and Isles General. All three are in houses. Isles General is on the bottom of this two story home. (The Pink and Blue stores are much smaller.) There is a small room stocked with groceries and another small room with boating and household items. For $39.10 today, we got two large cans of juice, some fresh broccoli, a package of frozen broccoli, and two large containers of yoghurt. These prices are the reason we provision before we get to the Bahamas, but we still need to buy fresh food from time to time. The more populated settlements, such as Georgetown, have larger stores with more reasonable prices. One of the highlights of Staniel Cay, besides having the James Bond movie “Thunderball” filmed here, is Pig Beach. Years ago a few pigs were left on Big Majors Island and every year there are new piglets. People come close to shore in their dinghies or small boats and the pigs swim out to beg for food. We didn’t get close enough for them to do that because Sailor might have jumped out of the dinghy to play with them and that would not be good! 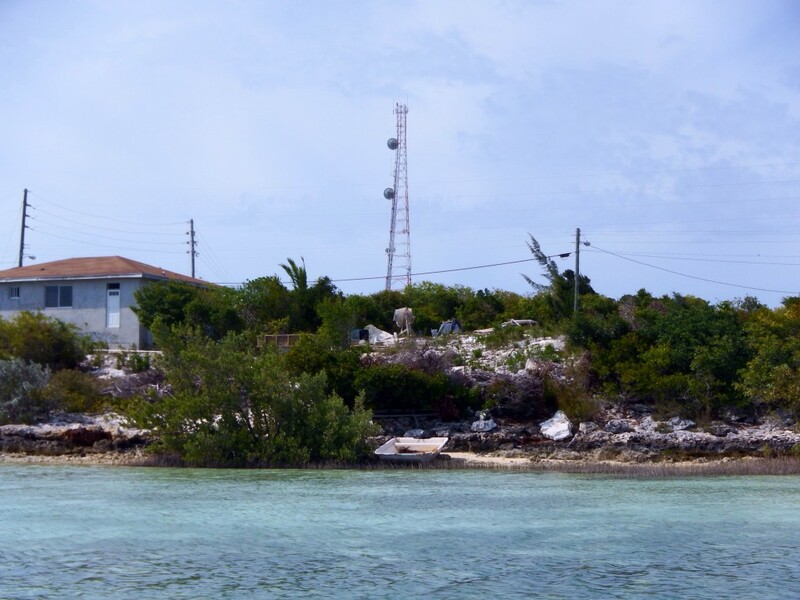 Most of the inhabited islands in the Bahamas have a Batelco (phone) tower. Under it is always a Batelco store, which makes it convenient to find one. These islands have strong phone and data signals, but the ones that don’t have towers and are far from islands with towers have weak or no signals. Cambridge Cay is in the Exuma Land and Sea Park where there are no Batelco towers, thus there is a very weak signal coming from the tower on another island and sometimes no signal. We have a Wilson cell phone signal booster and by placing our Bahamas phone in a cradle with a cord running to an antenna outside the signal went from no bars to five. We’ll be at Staniel Cay for a few more days and then will start north, stopping at a few islands before we leave the Exumas and sail to Eleuthera. This entry was posted in 2013 - 2014 Bahamas Cruise, Boat Maintenance and tagged Boat Repairs, Cambridge Cay, Staniel Cay, watermaker on April 12, 2014 by Jan.